We have had some rather long running projects on XDA over the years. Some involve simple, yet elegant things like theming engines (UCCW, VR Theme, etc), while others focus a bit more on the functionality side of things. The case for recovery images is one such area that needs to be constantly evolving due to the evolution of the devices and their inner workings. Pushing an insecure recovery into a device is not always easy. Or rather, it is not as simple as some people make it be. Lots of things and information are required even before beginning the process of loading it onto a new device. For XDA Recognized Developer Dees_Troy and other members of Team Win, this has been the case for a while now, but they always tend to come out on top. 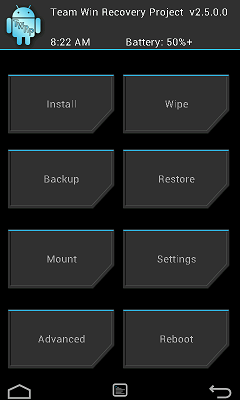 TWRP (Team Win Recovery Project) is an open recovery project that has been around for a couple of years now. It is a great alternative to the ever popular CWM if you are looking for something with a bit more flair and functionality. This new version, which stands at 2.5.0.0, is loaded with updates and fixes. These changes make the overall experience smoother and more enjoyable. For instance as of version 2.4.0.0, TWRP was given the ability to turn off the screen to save battery while in recovery. Version 2.5 takes that concept a step further and not only allows the user to select the timeout, but now even the screen brightness can be tweaked as well. On top of that, partition handling and selection has been vastly improved, and it is now easier to use thanks to the implementation of a scrollable list. And as if that weren’t enough, not being in the Android UI should not mean that you cannot enjoy a good looking recovery with our ever-growing-pixel-packed screens. So, a theme for 1080 x 1920 was added for devices like the Xperia Z, HTC One, and others. And speaking of which, the recovery is now available for the new beast from HTC… the One. Please do keep in mind that the new version is still undergoing somewhat heavy testing and there are some bugs that you may run into. On the other hand, if you manage to get this installed, rooting the One will be as simple as using the built in tool to inject SuperSU. Please take it for a spin and report feedback and bugs that you may run into.